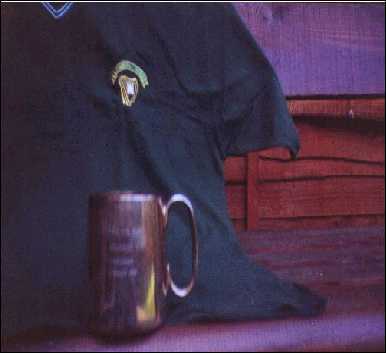 The tankard in the photograph was one of only 13 made to be presented to the Hibernian team (and as it was a friendly  2 substitutes) who lined up against Real Madrid at Easter Road on October 7, 1964. When Hibs made the decision to commemorate the occasion with these tankards they could have had no idea just how memorable that night would be. To put it into perspective lets look at Reals pedigree at October 1964. Winners of the first five European Cups culminating in what is regarded as the greatest game of all time, the 7-3 victory over Eintracht Frankfurt at Hampden in 1960 when Puskas scored 4 and Di Stefano 3. Runners up in 1962 to Benfica when incredibly Puskas scored another 3 goals. Runners up again in 1964 to Inter Milan, only 6 months before they played Hibs. There is no doubt that Real remained in 1964 the most famous club side in the world. Although they were being challenged for their European dominance by the 2 Milan giants, who won the European Cup for 3 consecutive years from 1963 and by Benfica, dual winners in 1961 and 1962, Real were the team everyone wanted to beat. Real were to prove their continuing greatness by winning the top trophy again in 1966 only 19 months after their visit to Easter Road. The stage was set therefore for a great contest, which took place in front of just over 30,000 at Easter Road in 1964. With their pride at stake, Real did not treat any game as a friendly. Hibs however turned in the performance of a lifetime and ran out worthy 2-0 winners with the goals being scored by the 19 year old Peter Cormack and an own goal by Zoco. Anyone who was there however will remember one player only on the night, the incomparable Willie Hamilton. The Hibs team was Wilson; Fraser, Parke; Stanton, McNamee, Baxter; Cormack, Hamilton, Scott, Quinn, and Martin. It should be pointed out that this was a very good Hibs team. All 5 of the forwards shown were capped by Scotland as of course was Pat Stanton while John Parke was a regular for Northern Ireland. Another point of interest was that 7 of the 13 Hibs players were local boys and Hibs supporters. That was and still is certainly true of the 2 substitutes, Eric Stevenson & Jim ORourke. It was Jimmy ORourke who made the magnificent gesture of donating his tankard to London Hibs. Jim, were only keeping it in trust for you, it will be well looked after.